During the summer of 1989, BR advertised, once again, a series of "Inter-City Days Out", though the list this year was much reduced compared to last year's. One trip that had survived was to Canterbury, based around one of the denizens of Table 50, the 0618 Manchester Piccadilly - Folkestone Central, and its balancing working, the 1716 Folkestone - Manchester. We decided to give it a whirl! My travelling companions were to be a friend and my son, and it was with them that I waited at Wolverhampton one morning in late August, for the train's scheduled departure at 0739. We needn't have hurried as it was announced "running approximately 16 minutes late". It was running exactly 16 minutes late in fact, pulling out at 0755. A bad omen? Our route was to be the former GWR line via Oxford and Reading, with the usual detour through Coventry. A highlight of this stretch was the sight of an Army train on the link to CAD Kineton - two Thomas Hill "Vanguards" on one Speedlink wagon! One of the reasons why we decided on the trip was the potential interest of the route through London. A right fork at Old Oak Common took us onto the line via Kensington Olympia, before threading the maze of routes in the Clapham and Battersea area. We traversed Latchmere, Longhedge and Factory Junctions to gain the former SECR line, through Penge Tunnel and Bromley South, then out through Swanley and on to Chatham. Everywhere there seemed to be EMUs in the south-eastern area "Jaffa Cake" livery, or the dreaded NSE red, white, blue and graffiti! I hadn't appreciated what a problem graffiti has become. I don't think we saw a single electric unit that had not been defiled in this way, somewhere on the exterior paintwork. Lets hope the disease can be cured, and doesn't spread to our own neck of the woods. Just one more stop - at Faversham, where the Margate line diverges, then on to Canterbury East, where we arrived just six minutes late after a most interesting journey. We had decided to head for Dover, though our present train was to continue ahead of us along the last leg of the journey - our tickets only being valid to Canterbury, we had to de-train and re-book for the remaining 16 miles. Fortunately a NSE special offer meant we travelled at two-thirds fare (and son for a pound!). Highlights (?) of the journey included the derelict Snowdown colliery, a late bastion of steam, and the junction for the former East Kent Railway to Tilmanstone colliery, now also defunct. We spent an interesting afternoon in Dover - starting with the long trudge up to the castle, grateful that the hottest part of the summer was now past! The castle allows a splendid view of the port installations, and it was to the latter that we next bent our steps, with a brief pause to allow son to indulge in some shingle-based civil engineering. Alongside the hoverport runs a jetty forming an excellent vantage point for the hovercraft and jetfoil which seem to operate a very frequent cross-channel service. I wonder how it will all be affected when (if?) the Chunnel opens for traffic? Our final destination was Dover Western Docks Station - we had earlier arrived at Priory Station. What a magnificent structure this is! 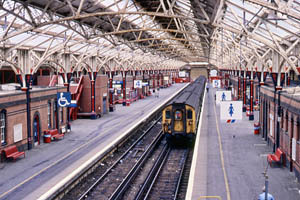 Much modernisation work was in evidence, though passengers were conspicuous by their absence. No doubt the station sees intense activity on arrival of the train ferries. We became the only passengers on the 1632 to Victoria, which left on time to the second! We could have rejoined the Wolverhampton train at Dover Priory, but instead returned to Canterbury, where we had just sufficient time to obtain fish and chips! The return run was virtually the outward journey in reverse - to the extent of being seated in the same coach, opposite our earlier seats. The only difference in fact was the omission of the Slough stop (no great loss). We had left Canterbury at 1748 (one minute early) and before long we began to meet the rush hour. For the next hour or so, until we reached Bromley South, the number of train passing in the opposite direction was almost unbelievable. I remain eternally grateful that I don't have to participate in such rituals as the rush hour. We ran more or less to time all the way back, being a minute early into New Street. Delays between the latter and Sandwell and Dudley meant that our ultimate arrival at Wolverhampton was about 6 minutes late - hardly a great inconvenience. Our connection - my car, waiting patiently in the car park - would be held indefinitely! Conclusion? - a good day out. A cross country Inter-City loco-hauled train such as ours is certainly a relaxed way to travel. I just hope the reduced number of routes this year is not a ominous portent for 1990. Watch this space next year!